Two-try hero Ben Foden feels the Worcester wake-up call has been a good thing for Saints. Jim Mallinder’s men were beaten 13-12 by the Warriors in the opening game of the Aviva Premiership season, but they responded superbly against Newcastle Falcons on Saturday. Foden and Christian Day both scored twice and Luther Burrell also dotted down in an emphatic 42-16 success at stadium:mk. 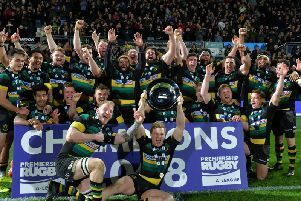 It was a welcome win for Saints as they sought to erase the Sixways demons. And Foden said: “It’s always disappointing when you don’t start the season as you wanted. “Worcester surprised us and we were probably a bit naive going into that fixture, thinking it would just happen. “We got a bit of a shock, had to take a hard look at ourselves and we’ve managed to get things rolling with the bonus-point win we were looking for here. “The good thing was that the Worcester game was the first of the season, not the last, so you always get that opportunity to right things. “It was a bit of a wake-up call to us and it’s always probably a good thing to happen to you early on in the season. “It wasn’t really the result or performance we were looking for.